I am glad the people at McDoDo finally woke up their bladdy ideas and realised just how stupid they were. I guess they were afraid of offending the Hindus as well, when they omitted the sacred cow from their cow senses. No? 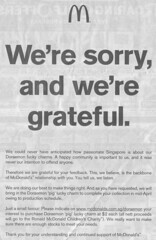 Kudos for taking up the big ad of apology (click image on right to enlarge) in the $traits Times dated 22 Jan 2010. Please feel free the dock the wages of the PR department to pay for the big ad. Still, I wasn't 100% satisfied with the apology as they made it sound the unforeseen problem came out of the blue and they responded promptly to resolve it. Hence, a well-deserved pat on their own backs for "being closely connected with the local market". Yeah right. Bruff who? Let's face it, the problem was there like an elephant in the room the moment the idea to omit the piggy plush was mooted. It was there from day 00, so don't give me the crap that nobody saw it then. We have celebrated countless number of Years of the Zodiac Pig in Singapore and it is only in 2010 (about 7,000 years since the beginning of the Chinese civilisation) when some Einstein woke up to the epiphany one day that a piggy plush toy (technically, it was a robot cat in a piggy suit) may offend our Muslim brothers and sisters? Seriously, if the ad line had been "We're sorry. We were stupid. ", I would have gone straight out of the house to the nearest McDonalds and order a full Big Mac meal with upsize, just to show my appreciation. Yeah. Even if they are my least favourite burger joint. Hahaha why? You got something against them cos you born in the year of the pig issit?? Pam: Not sure about that but given the McDonalds has been in Singapore since the late 70s, surely by now they would have figured it out? Easily two Years of the Pig in between too. Mistress Grace: The fact that it was the pig that was taken out is just a coincidence. I would have taken the same issue if say they take away the Ox for fear of offending our Hindu brothers or something to the same effect.